The images used for the base of this globe were chosen from coverage supplied by the Galileo solid-state imaging (SSI) camera and Voyager 1 and 2 spacecraft. The individual images were radiometrically calibrated and photometrically normalized using a Lunar-Lambert function with empirically derived values. A linear correction based on the statistics of all overlapping areas was then applied to minimize image brightness variations. The image data were selected on the basis of overall image quality, reasonable original input resolution (from 20 km/pixel for gap fill to as much as 200 m/pixel), and availability of moderate emission/incidence angles for topography. Although consistency was achieved where possible, different filters were included for global image coverage as necessary: clear/blue for Voyager 1 and 2, and clear, near-IR (757 nm), and green (559 nm) for Galileo SSI. Individual images were projected to a Sinusoidal Equal-Area projection at an image resolution of 500 m/pixel, and a final global mosaic was constructed in this same Sinusoidal projection. The global mosaic was then reprojected so that the entire surface of Europa is portrayed in a manner suitable for the production of a globe. 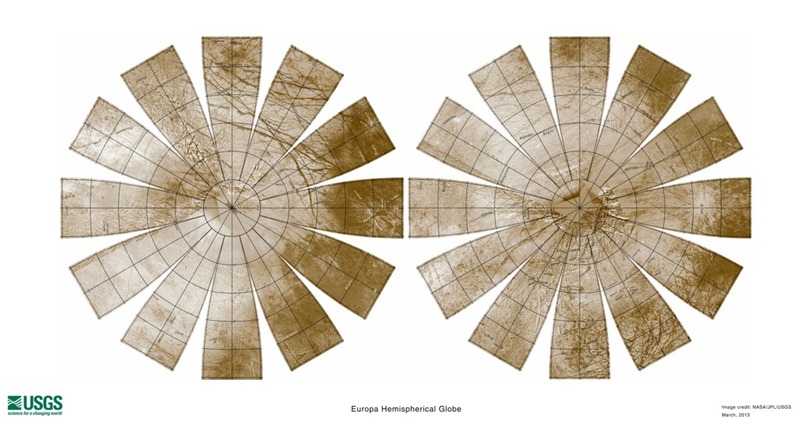 A specialized program was used to create the "flower petal" appearance of the images; the area of each petal from 0 to 75 degrees latitude is in the Transverse Mercator projection, and the area from 75 to 90 degrees latitude is in the Lambert Azimuthal Equal-Area projection. The projections for adjacent petals overlap by 2 degrees of longitude, so that some features are shown twice. Names shown on the globe are approved by the International Astronomical Union. The number, size, and placement of text were chosen for a 9-inch globe. A complete list of Europa nomenclature can be found at the Gazetteer of Planetary Nomenclature. The northern hemisphere is shown on the left, and the southern hemisphere is shown on the right.